Of course, of all the places our little ones want to whine about life, it would be outside. Lol! Anyway, I just want to share with you what I personally do whenever my little one have tantrums in public. Well, I don't really go out without my husband but when I do I always tell Maco to listen to Mama and I pray that she'll not pull her bratty self when we're out. Hehe! Of course this is given already. We should always be calm whenever our little one is being frustrated. It may sound easy, but no, it's not. Especially when my little one is already shouting and crying. It wasn't easy to stay calm at all! But I just take a deep breath and exhale. I think that helps! This also is quite hard to do because you just want your little one to stop whining, but the little one doesn't want to, so mostly we think that we'll just give what our little one wants because we know it'll stop them from crying. But, we're not aware that we're just helping our little one to be bratty more. So, if we could help it, I think it's best to not give in. Because if we gave in, then I'm pretty sure it'll just happen again and our little ones would think that she can get everything she wants if she cried. And again, be calm. After all the tantrums, it is best to talk to our little one on why we didn't give in on what they wanted. It is best to explain why so that they'll know. It may look like they do not understand, but I believe they do. Side note: Whenever my little one did something wrong, I make her stay in the corner and tell her do not move, and she doesn't. So I guess toddlers as young as 18 months or even younger can understand us already. Yes of course when the little one is screaming and crying outside, people would be looking. And when the first time this happened to me, well, I was embarrassed, especially when it was just me and Maco. Because I don't want other people to be staring at us! Lol. I feel like they're thinking I'm hurting my little girl. So when this happened to me again, I thought to myself, why the hell would I care about them when my little girl is having her issues (lol). And so what I usually do is hug my little one or if she's trying to lay down on the floor, I kneel and try to be calm as much as possible and tell her she doesn't have to cry and explain to her why she can't have this or that. It was hard because my little one doesn't listen. Hehehe! So, these are my tips on how to handle our toddlers in public when they're having tantrums. Anyway, these are just from my personal experience. 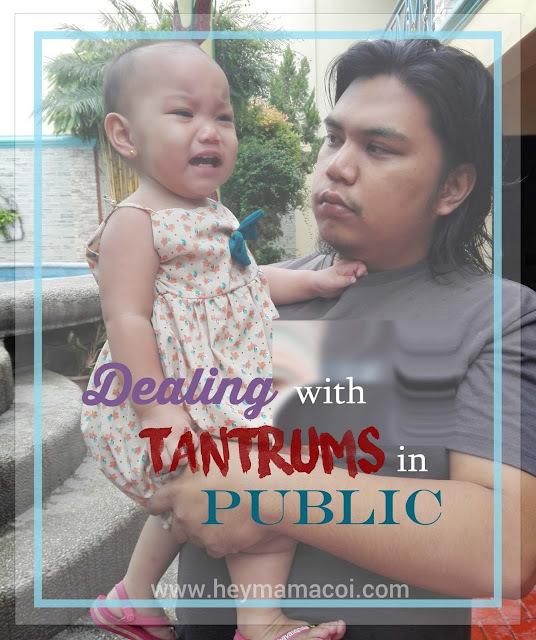 And if you have your ways on how you handle your little one in public when they're having tantrums, please share it with me on the comments! Thank you! Good advice, Mommy! Buti na lang nasasanay ka na. It is really important that you keep your cool when under pressure. Yes, keep your cool and it is also best to ignore the toddler who is having a tantrum. If the child notices that no one is looking at her, she will eventually stop crying. I love your last advice the most - dont mind other people. We tend to be too cautious when in public as do not want to make a scene and for others not to mind as we well. But yes, hey, why think of them when my first concern is to comfort or talk to my child. Thank you for this and I hope to always keep your list in mind. I agree with all the points especially the "Do not mind other people". I've experienced that in the airport when our flight was cancelled, nagtantrums na anak ko sa sobrang tagal. People were all staring na but I don't mind them. Brilliant tips, mummy, those are exactly what I practice too! I don't care whether other people (usually other mums, unfortunately -- the men usually don't bother) give me the side eye; I am not giving in to the kid's demand! People can be very judgmental sometimes, kung ano-ano agad sasabihin pag di napatahan ang anak. I haven't noticed Nate throw a tantrum, when he does, very minimal lang. Thanks for the tips, #1 is very important! Baka pati ang mama mag tantrums. haha. So far nagtantrums pa lang si LO pag inaantok na siya and I agree with your advice especially the last part. I used to be aware when someone is looking at us if my baby is having tantrums but I shouldn't care about it. What's more important is what your child feels that moment. Thank you for the tips! I need it. My son's turning 1 next month and he's starting to act up already. Buti na lang cool ako lagi. And true on not minding other people. My son's always my priority even when he's screaming. So far we had no tantrums yet outside of home, usually when I do feel that she will have one I offer her my booby to calm her down. I've never had problems with public tantrums until I had my youngest. He's really strong willed. Minsan talaga napipikon kami ng husband ko, and it takes so much of us to control our inis lalo when our son is throwing himself on the ground and won't budge. But as we have learned, if we just continue to be patient and firm, we can channel this willfulness into something more productive. All perfect points. It shouldn't matter what other people think. The important thing is to resolve the situation. It also works to kneel down to their level and talk to them. I'm thankful I haven't had to deal with tantrums from my kids. They're very understanding when we're out and I can't buy something for them. I'm thankful my kids weren't the types to throw tantrums in public (both were very shy and they didn't like it when people looked at them). There was only one incident when my son threw a fit in a mall. It was when he was only 2 years old. We just let him be until he calmed down. Thankfully, it never happened again. We never got to experience tantrums with our girls though. The "don't mind other people" is for me the hardest of all the tips you've mentioned. My son threw tantrums once and some passers-by looked at us na para bang ang sama kong nanay for letting him cry, muntik na ako mapaaway LOL!